Stairways are the unsung workhorses in a multi-story house. They get lots of use and take plenty of abuse on a daily basis. Over time, they can easily become worn down and dilapidated. Sometimes the wear and tear becomes so great that the stairway and railings break down and become dangerous to use. Since damage to stairways is gradual, it is often easy for a homeowner to miss it. Following are five reasons to invest in stair repair and railings. Perhaps the most obvious and most important reason for repairing stairs and railings is safety. Stairs that are in disrepair are a potential hazard to anyone who walks up and down them. Regardless of whether the stairs are leading up to a second floor or down to a basement, they should always be in good working order. Stairs that lead to a basement are exposed to a large amount of moisture that can lead to rotting, bowing, heaving or splitting. A simple misstep can result in injury to anyone heading down the stairs. Stairs that go between floors can also be hazardous to the inhabitants of a home if they are not in good condition. Stairs can be slippery or have loose boards, which can both lead to falls. Anyone who finds themselves in a slippery situation will likely grab for railing. If the railing is weak, it will not be able to protect and support someone who is falling. Your home is an extension of you and your family. The way it looks helps to develop people’s perception of you. Whether you entertain often or just have the family at home, it is important to keep your stairway looking its best. Many homeowners often fail to consider their stairways when they are focusing on home repair since it is not considered part of a particular room. However, stairways should never be neglected. Stairways that become run down and worn out do not have an aesthetically pleasing appearance. Broken boards, flaking paint, and other issues detract from the overall appearance of the home. 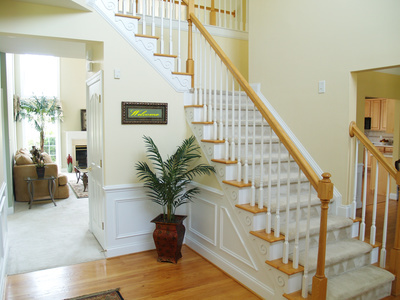 Correcting these issues brings the entire area around the stairs back to the beauty that your home and family deserve. Handrails on stairs are often taken for granted. They are there and everyone uses them, but not many people are aware of how important they truly are. Handrails are actually meant for more functional purposes than aesthetic ones. Railings are installed on stairways to act as safety features. They need to be sturdy and able to support a significant amount of human weight. When railings are not present, loose or broken, stairs pose a safety hazard to anyone who is traversing the steps. Without properly functioning railings, it is easy for someone to fall down the stairs, or even off of them, and become seriously hurt. Thus, it is vitally important to the health and wellness of anyone who uses a staircase to have a sturdy railing. If a railing is in any state of disrepair, it should be repaired or replaced as soon as possible. In the realm of stairway repair, boards that are squeaky might seem like a minor problem since it does not adversely affect the functionality of the stairway. However, squeaky boards can be quite a nuisance if they are not taken care of. The squeak of a stair being stepped on can be loud and often happens at inopportune times. Squeaky stairs have been known to disrupt a quiet house and wake sleeping babies. It is a far better choice to have them repaired so everyone can get some rest. Also, not only can a squeaky stair be annoying, it can sometimes be indicative of a larger problem. Stairs often squeak because the boards have loosened. If the squeak goes unchecked for a prolonged period of time, a larger and more dangerous issue can arise. Stairway squeaks can be seen as a warning signal that repairs need to be made as soon as possible. Sometimes, houses are not arranged in an ideal way. Unless you have designed and built your own home, it is quite likely that there are imperfections in the design and layout. A common design flaw in houses is the placement of the stairway. It can easily impede someone’s ability to walk from one room to another. Investing in stairway repair can reconfigure the entire stairway so it produces a better traffic flow for the people in the house. Repairing the stairway in your home is a great investment. Not only can it make the house safer for you and your family, but it can also add to the aesthetic beauty and make the house more functional. If your stairway and railing need to be repaired, hire a local professional with the knowledge and experience to fix any stairway issue.